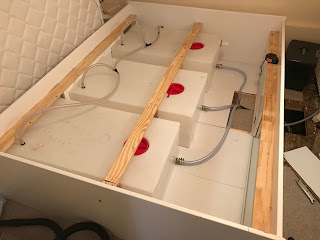 I have spent the last several days working on additional water storage on board. 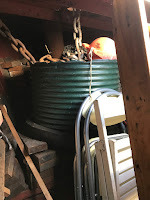 When we purchased the boat, it came with three plastic water tanks that fit nicely underneath the double bed in the front berth. I was developing plans on how to hook everything up but first wrote the former owner and asked several questions. I'm glad I did. a 700 liter tank in the bow. But during renovation it was removed. I can see references to it in some documents from the past and as long ago as the 1980s, people were urged not to use the water from this tank. It was rusty and perhaps that is the reason. I thought I would need to run pipe or hose from the rear part of the boat to the new front tanks. In fact, the line from the original storage was still in place and a fitting had been attached to its end. I just needed to attach fittings to the tanks and attach hose to the existing fitting. Also installed was a vent line to the outside of the boat that is used to signal that the tanks are filled up and allows air to come in as water is removed. I needed to break down the bed to gain access to the tanks and to be able to work. Most of my time was on my hands and knees. But progress was made and after a day and a half, the job is complete. My only concern is the location of the new tanks. All three sit to the port side of the center-line of the boat. 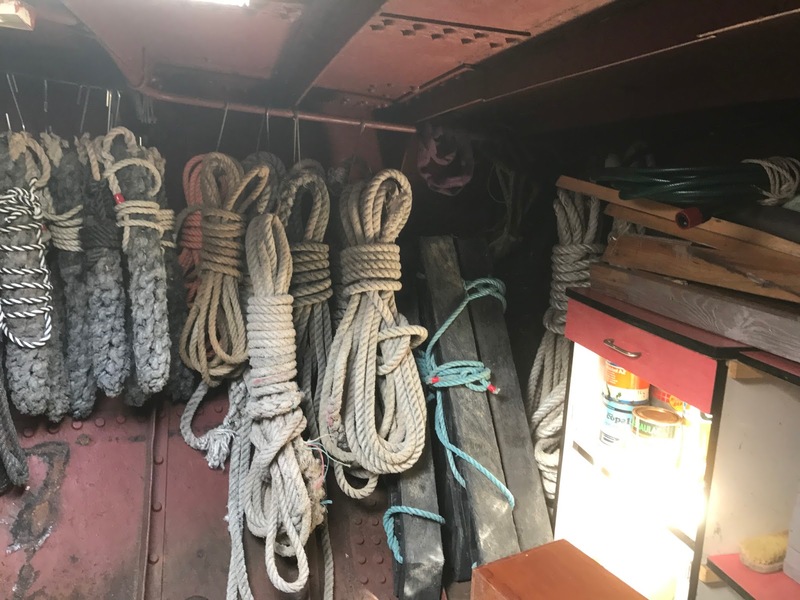 Will the boat have a list to the port side? I will have to wait until I put water in the tanks to see how it affects the boat. 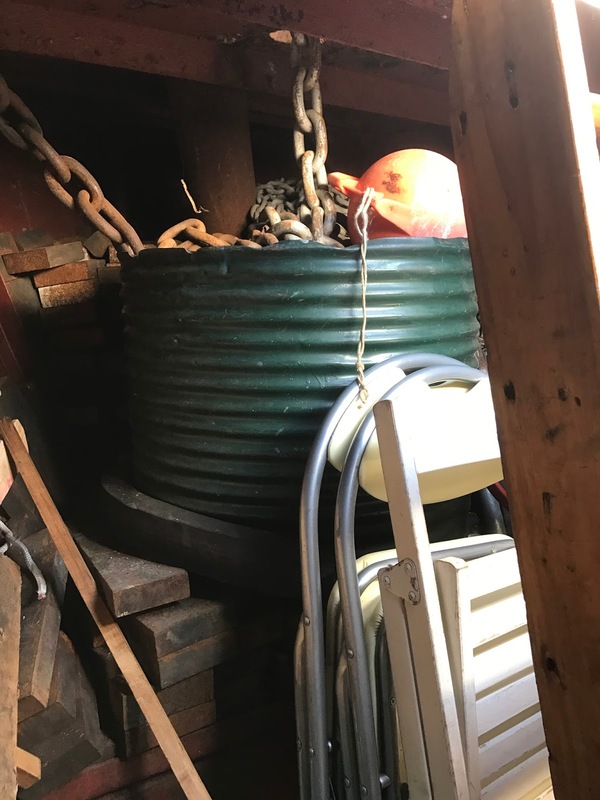 While working under the floorboards, I did spot a large chunk of solid steel obviously placed there to balance the boat. Perhaps more ballast will need to be placed forward and to the starboard side. "must have" things I noted stacks of steel bricks just at the bow. 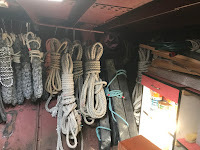 This, along with a lot of chain for the anchor, was what someone put there to trim the boat. Sounds like you know what you are doing. Good thing. Were you Ever in the Navy?